A journalist announced last week that he will publish a photograph of then-Illinois Sen. Barack Obama (D) and Nation of Islam leader Louis Farrakhan that he took in 2005 at a Congressional Black Caucus meeting, but did not make public because he believed it would have “made a difference” to Obama’s political future. “But after the nomination was secured and all the way up until the inauguration; then for eight years after he was President, it was kept under cover,” Muhammad said. Reached by TPM on Thursday, Muhammad said a “staff member” for the CBC contacted him “sort of in a panic” after he took the photo at a caucus meeting in 2005. TPM has published the photo above with Muhammad’s permission. “I sort of understood what was going on,” Muhammad told TPM. “I promised and made arrangements to give the picture to Leonard Farrakhan,” the minister’s son-in-law and chief of staff. Muhammad said he gave away “the disk” from his camera but “copied the photograph from that day onto a file” on his computer. “Realizing that I had given it up, I mean, it was sort of like a promise to keep the photograph secret,” Muhammad said. 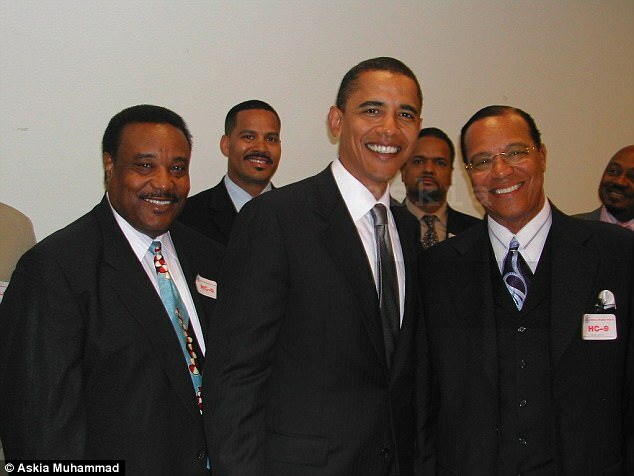 Muhammad said he thought the photograph would be “damaging politically” if it were released and was afraid that someone might “break into his apartment” looking for it, like “that Watergate crap.” He said he “felt a little bit more at ease” after Farrakhan in 2016 claimed that Obama visited his home in Chicago. Muhammad contacted Farrakhan in autumn 2017 with the “final manuscript” for a self-published book containing the photo. Muhammad also told TPM that around the time he took the photo, he asked Obama about a perceived resemblance to Farrakhan. TPM learned about the photograph and Muhammad’s upcoming book from a write-up in Richard Prince’s Journal-isms newsletter. A spokesperson for the Congressional Black Caucus suggested that TPM contact the caucus’ former chair, Mel Watt, who now leads the Federal Housing Finance Agency. Watt did not immediately respond to TPM’s request for comment. Muhammad is the news director at Washington, D.C. radio station WPFW and has served as the head of the Washington offices of the Nation of Islam’s official newspaper, The Final Call. Farrakhan is a minister who leads the Nation of Islam and has made anti-Semitic remarks. During Obama’s presidential campaign, conservatives pushed multiple apparently racially motivated conspiracy theories about Obama’s religion and supposed ties to Islam. During the 2008 presidential election, conservatives questioned the indirect ties between Farrakhan and Obama, who attended a church that gave Farrakhan an award. At a 2008 presidential debate in Cleveland, Obama said he had “been very clear” in his “denunciation” of Farrakhan’s remarks.